The final big invitational of 2018 on Pennsylvania soil came Wednesday with the Robert J. Burdette Classic at Lehigh. A number of top performances came in a strong post-Christmas meet. We highlighted some of the top performances below. Talitha Diggs showed off her speed last week at the Bishop Loughlin Games in New York, running a pair of PA#2 times. This week, the Saucon Valley junior displayed her strength, moving up to the 800 meters. Diggs won a close race in the 800 meters, kicking past Penn Wood's Elicia Moore and Great Valley's Amy Willig in the final stretch. All three girls clocked in at 2:20, with Diggs taking the win in 2:20.18, a PA#1 time. Moore took second in 2:20.35 (PA#2) and Willig was third in 2:20.80 (PA#5). Pennridge had a strong day at Lehigh. In the 400 meters, Andersen Dimon showed he'll be a serious contender in the event this season. Dimon went 49.61, a PA#1 time, claiming the victory over the field by over 2 seconds. Dimon came back to contribute a leg on the Rams' 4x800-meter relay. Pennridge clocked a PA#1 time of 8:15.68, showing off its depth and pulling away from the field in the second half of the race. Matt Eissler gave the race's quickest split, anchoring Pennridge with a 2-flat leg. Victoria Atkinson opened up her season well. 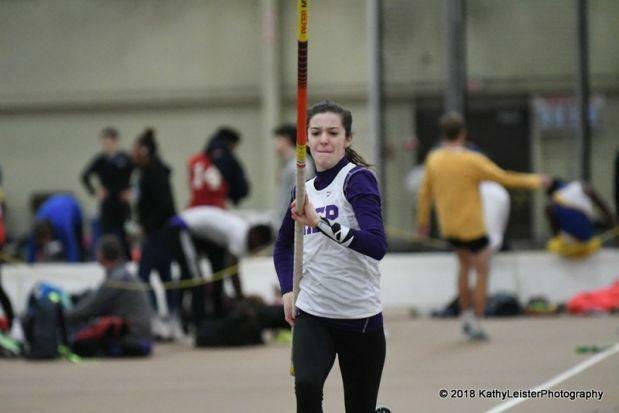 The Scranton Preparatory senior cleared 11-10, a PA#5, to take the win in the girls pole vault. She had some good looks at 12-02 as well. A pair of other PA girls jumped 11 feet. Western Wayne's Trina Barcarola took second, while Wilson Area's Sara Altonen was third with Barcarola having the advantage on jumps. There's been some terrific vaults already this season in PA and Wednesday proved that more than a number of girls will be in the hunt this season for the top spot in the state in the pole vault. Sydney Hawkins of Phillipsburg (NJ) came to PA and had a big day in the sprints. The senior won both the 60 meters and 200 meters in dominant fashion. Hawkins ran 7.70 in the 60 and came back to win the 200 in 25.50. Both are NJ-leading times. Read more about the NJ talent at Burdette over at NJ MileSplit. Emma Zwall of Penn Charter looked strong in the 3K, solo-ing her way to the win in 10:33.50, a PA#5 time. In one of the day's most exciting races, Easton's Skyler Danley kicked past Penn Charter's Abigail Zwall (Emma's sister) for the win in the girls mile. Danley waited for her final chance to make a move and edged out Zwall at the line by just .05 for the win. Watch the race above. Kate Willshaw of Easton continued her strong season in the high jump. Willshaw, who jumped a T-PA#1 5-07 at Bishop Loughlin last week, cleared 5-05 for the win, making it back-to-back strong performances for the senior in the event. Upper Darby's Kayla Thorpe also kept up her momentum. She won the shot put with 40-10.25, yet another improvement on her PR. She now sits at PA#4. On the boys' side in the shot put, Thomas Kitchell launched a big PR. The Notre Dame-Green Pond junior tossed 52-09.75 for the win. That moves Kitchell up to PA#2 on the season. 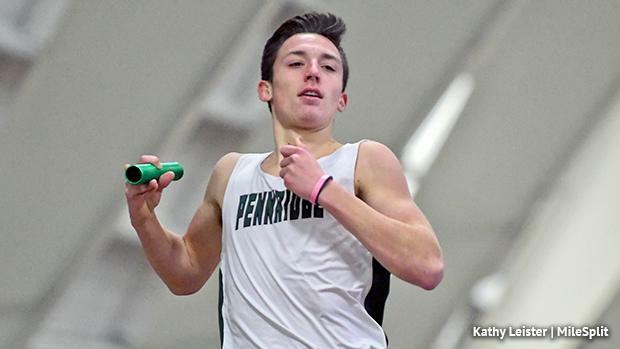 PIAA Class A state champion from the XC season opened up his indoor season well. Jenkintown's Jack Miller went 4:32 (PA#4) to win the boys mile in runaway fashion. In the 3K, Penncrest's Patrick Theveny clocked a PA#2 time of 9:03.77 to take the victory. Norristown swept the 60-meter races on the boys' side. Austin Montgomery won the 60-meter dash in 7.06 and Ramir Wiggins ran a PA#3 time of 8.57. Boyertown bookended the day with wins. The Bears started off Wednesday by winning the SMR in 3:42.56 and closed out the day winning the 4x400 in 3:31.92.